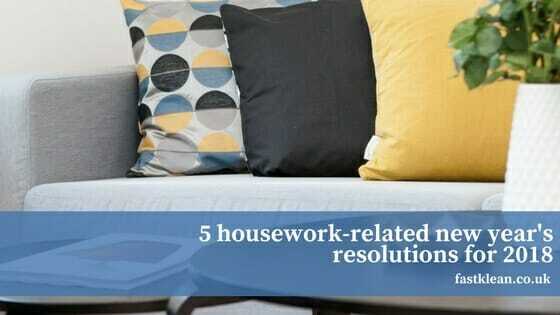 Is your housework schedule all in a pickle after your Christmas and New Year celebrations? That’s to be expected, but if you’re adopting the ‘new year, new me’ mantra for yourself, why not adopt it for your home too? ‘New year, new sparkling home’: that sounds pretty good to us. With this in mind, we’ve put together a few cleaning-related resolutions for you to adopt as 2018 gets underway to make sure your home is spick and span for the rest of the year. Doing the housework can seem like a daunting prospect when you’ve got it all to do at once; the dusting, the mopping, the vacuuming, the laundry, the washing up – so many tasks, so little time. Remove this burden from your life in 2018 by doing a little bit of cleaning every day so you never have to waste a weekend scrubbing the house from top to bottom. Spend ten minutes dusting while your tea cooks after work one evening, do the washing the next night and the vacuuming the day after. Repeat the cycle each week and you’ll soon find yourself keeping on top of things without the housework taking over your life. Appliances are there to help, so use them! Don’t wash up by hand if you’ve got a dishwasher and don’t clutter your house with damp laundry if you’ve got a tumble dryer. Can’t be bothered sweeping the wooden floor? Just use the vacuum cleaner on it after you’ve done the carpets. Get the most from your appliances this year and let yourself be a little lazy. Instead of buying dozens of bottles of chemical-based cleaners that have powerful smells and could irritate sensitive skin, pledge to make your own homemade cleaning products wherever possible. For example, fresh lemons are great for getting rid of unpleasant odours around the house – much more so than lemon-scented chemical cleaners. Meanwhile, bicarbonate of soda and vinegar is a good substitute for chemical-laden stain removers – in fact, bicarb of soda is naturally abrasive, meaning it’s ideal for getting rid of stubborn dirt and grease on a whole variety of surfaces. Every now and again, the results of a survey arise showing how infrequently Brits change their bedding, despite lying on it with their warm, sometimes sweaty, sometimes poorly, bodies for an average of eight hours a night. Next time one of these reports comes around, make sure you don’t have to worry about the level of bacteria in your bed by committing to changing your sheets, duvet cover and pillow cases once every fortnight throughout 2018. Few feelings are better than sliding into freshly-changed sheets in an evening, so let yourself enjoy this little pleasure every two weeks this year. Hate vacuuming behind the sofa? Too scared to tackle carpet stains by yourself? Struggle to keep your kitchen surfaces clean with sticky-fingered little ones and a busy schedule? Stop yourself feeling burdened with these tasks in 2018 and treat yourself to the luxury of hiring a professional cleaning company to tackle those bigger or dreaded jobs for you. The rate at which last year flew by shows that life’s much too short to spend on the chores you hate. What are your New Year’s Resolutions? Please feel free to share them with us in the comment section below.